Are you hosting a party? Is it for adults or kids? Does it have a theme? Have you thought about having a bowling party? Bowling is an interesting fun sport. It keeps everyone involved. Be it kids or adults, everyone loves bowling and bowling party. It keeps everyone engaged and kids and adults can play it as a team. And bowling themed party are quite fun! If you're thinking of throwing a party, you need invitation cards. Invitations cards don't have to be boring or formal. They can be fun, funny and colorful. 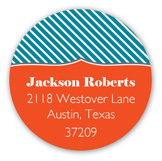 At Polka Dot Design, they can be stickers too! Invitations are important. Very Important. Like a business card depicts the business, invitation cards announce the kind of party you're invited to. For planning a bowling party, you should get the right kind of supplies. You have to set the stage for this fun party you're planning. Among all the necessary supplies, you cannot miss invitation cards. Party invitation cards are your party's sneak peek. They're a short trailer and the introduction to your party. 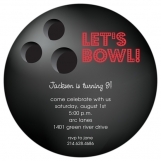 By sending out these colorful and creative bowling party invitations your guests will get excited to attend your party. Party invitations declare the theme, fun factor and colors of your party. And your guests do want to know this information! For bowling parties, you cannot do this a simple boring invitation card. Send out bowling party invitations to add another layer of fun. This will ensure the guests are as stoked as you are. You will throw a strike with these ideas. 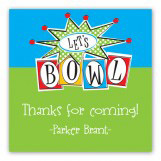 Take a look at our cute designed invitations for kids bowling parties. 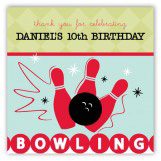 We offer a number of design and styles for your bowling birthday party. From round to square, sticker to folded card design, we have everything. 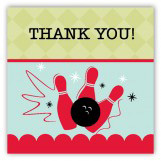 By sending out our bowling invitations, no one would want to miss your party! Spare them the trouble of finding a gift idea. Check out our stationery store for gifts ideas. Personalized stationery makes a perfect gift for kids. By sending out the right invitation cards, you can add charm to your party. This will get people excited about your bowling birthday party. Themes and colors work that way. If you're planning to bowl for your kid's party, you cannot miss our bowling party ideas! If your bowling party has to rock, you need cute invitations. This will stamp the fact that you're hosting a bowling party people cannot miss. Our designs cater to both adults and children. We offer a variety of styles and kids birthday invitations. These will cater to your kids birthday party ideas. If you're planning to party, you need the bowling invitations. Order online from Polka Dot Design. Create your own cards with our wording ideas. We offer colorful and interesting invitation cards. 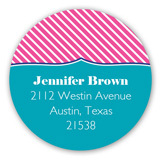 Buy matching stickers in different shapes, styles and design. Have a look!